New York’s highest court has issued its opinion in the dispute between the Jenack auction house and Albert Rabizadeh. 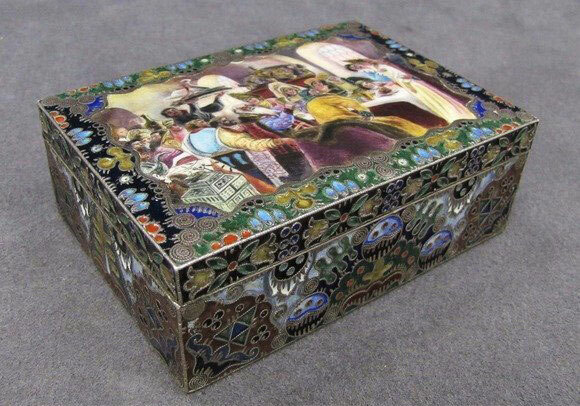 At issue was whether Rabizadeh would be required to follow through with his winning auction bid for this 19th century Russian box ornamented with silver and enamel. The intermediate appellate court had earlier left a small window open which might use the statute of frauds to compel auction houses to reveal more information about consignors, buyers and sellers. That will not be happening any time soon, at least via this case. We agree with the Appellate Division that the absentee bidder form, along with the clerking sheet, provide the necessary information to establish the name of Rabizadeh as the buyer. This conclusion is inescapable given that each of the documents contained information pertaining to the terms of the sale as required by the Statute. Both contain the item number, the bidder number, the auctioneer, and a detailed description of the item. So essentially there are enough details in auction house practice to preclude a possible fraud being committed on a buyer or seller. And the underlying bad behavior by Mr. Rabizadeh of bidding up to $400,000 and then refusing to pay had much to do with the decision by New York’s highest court. So where does this leave all the upheaval of the past year? It resolves the question conclusively in the most important art market in the United States, no small thing: an auctioneer is the person on whose account the sale is made as a matter of agency, and they need not disclose the actual consignor or owner. The uncertainty of the past year in which a winning bidder could have forced the disclosure of the actual consignment owner is finished for good. Auction houses to whom these practices are important will no doubt breathe a sigh of relief. Is all this a good thing? The fact remains that no one makes an auction purchase at gunpoint, and if anonymity drives the availability of art, then it is hard to quarrel with. Those more focused on smuggled antiquities or looted art may be concerned that it will keep what they view as important provenance information unavailable. There too, however, the fact is that without anonymity any object with issues wouldn’t even appear on the market. Indeed, that visibility may (ironically, from the smugglers’ perspective) pull more out of the shadows. free speech, governance, and elections. In some important respects, China has become a rich country.